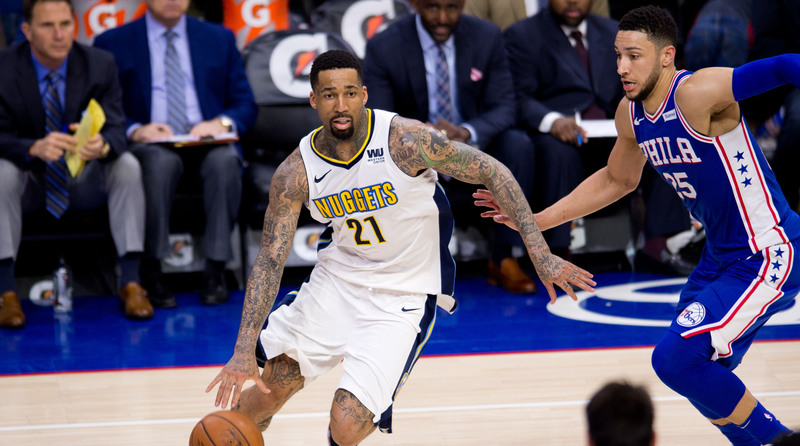 The 76ers utilized cap space to acquire Wilson Chandler from the Nuggets, bringing in another 3-and-D option to help their efforts to win the East. Wilson Chandler is headed back east. Desperate to shed salary with a rising payroll, Denver will send Chandler and 2021 second-round pick to the 76ers, reports SI’s Jake Fischer. Philly will also be able to swap second round picks in 2022, while sending back cash considerations to Denver. The Nuggets skyrocketed into the luxury tax this summer, signing Will Barton and Nikola Jokic to new deals the same year Gary Harris’s extension will kick in. Denver’s preference to shed salary is the Sixers’ gain, as Philly picks up a 3-and-D swingman who slots nicely into their open cap space. Chandler averaged 10.0 points per game in 74 games last season. Let’s grade the move for each team. With the big names off the free-agent market, Philly was forced to look into the margins as the summer continued. After re-signing J.J. Redick, picking up Chandler is another very solid move. Chandler shot 35.8% on threes for Denver last season, so he gives back the Sixers some of the three-point pop they lost in Marco Belinelli and Ersan Ilyasova. He’s also a capable defender. As we saw in Philly’s series against Boston, no team can have too many lengthy, 3-and-D types on its roster for the playoffs. Chandler as a bench piece will be useful in a future series with the Celtics, and he should fit nicely on the wing alongside any combo of Redick, Robert Covington, and Dario Saric. Philly is giving up nothing of note in the transaction, which means Chandler is essentially coming in on one of the many one-year deals being handed out this summer. He’ll be great to have this season, and the Sixers will still have flexibility to star hunt next July. Oh, and don’t sleep on the 2021 pick! That could be used as part of a Kawhi package, a future trade, or kept for what could be a loaded draft class if the NBA gets rid of the one-and-done rule. Denver was in a position of little leverage, looking to move excess salary to teams who have no reason to help out. Dumping Chandler without giving up a first-round pick is a win. The move saves the Nuggets about $50 million, according to ESPN’s Bobby Marks, factoring in the luxury tax cost on Chandler’s contract. While Chandler is a useful player, the Nuggets are betting on the younger Barton to slide into his place without much drop off. It’s unclear how much rookie Michael Porter Jr. can offer physically this season, be he also potentially stands to gain from the trade. It will be a short-term hit for Denver losing Chandler, but it makes sense for the front office to hand over bigger roles to its younger players. The Nuggets aren’t out of the woods yet—ideally they’d still find a way to dump the contracts of Kenneth Faried and Darrell Arthur. Even after the Chandler move, Denver is about $10 million over the tax line, according to Zach Lowe. Moving Chandler is just a start, but it’s a sensible one.